DETROIT - March 14, 2019 - PRLog -- Nicole Robert Jones is a nationally recognized transformational speaker, purpose to paycheck expert and best-selling author of four books, the most recent being Find Your Fierce. She is hosting a national tour "Find Your Fierce Experience" with a stop in Detroit. 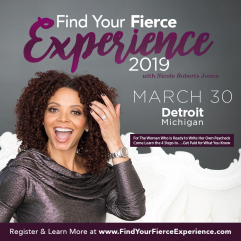 WHEN: Saturday, March 30 from 2:00 - 6:00 p.m.
WHAT: Bestselling Author and Purpose to Paycheck expert, Nicole Roberts Jones hosts her "Find Your Fierce Experience" in Detroit. The event will highlight and promote local women entrepreneurs, providing expert insight and action steps as they launch or grow their business. "The Find Your Fierce Experience is an opportunity for me to walk women through my Fierce Framework, which moves them from defining their purpose to how to build a six figure business from it," says Roberts Jones, Founder & CEO of The FIERCE Factor Lab. "What I am most excited about teaching the women of Detroit is how to grow your business alongside your 9 to 5 and the strategy behind making money while you sleep!" With more than 20 years of experience, Nicole has the innate ability to draw out what's best in a person and show her all the ways she can make money from it. Her mission is to help women create multiple streams of income from what they already know. She has worked with companies such as Dell EMC and the Steve Harvey World Group, as well as individuals from corporate executives, TV personalities and everyday women looking to start or grow their businesses based on their expertise. The 2019 schedule of "Find Your Fierce Experience" continues with stops in Boston and Charlotte following Detroit. For more information and to find the full list of dates, please visit www.FindYourFierceExperience.com. Nicole Roberts Jones is uniquely gifted at one thing – drawing out what's best in YOU and helping you take your Brilliance to The Bank. A veteran of the entertainment industry, Nicole worked in Talent Management and Casting before shifting her talents to become the Founder & CEO of FIERCE Factor Lab. She now works with entrepreneurs to create multiple streams of income from what they already know in order to build an empire from their expertise. Additionally, Nicole works with corporations to assure their executives and middle managers push their internal edge, and step into the true power of their gifts and talents at work. Her clients have included Steve Harvey World Group, Dell EMC, McDonalds, Blue Cross Blue Shield, Lisa Nichols and Motivating the Masses, Coach Diversity Institute, the BOSS Network and Working Mother Magazine to name a few. She lives with her husband in a suburb of Boston, MA, consulting, writing and creating breakthroughs for her clients.